Objective: This study assesses immediate effects on gait function of pelvic posterior tilting taping using kinesiology tape in chronic stroke patients with excessive pelvic anterior tilting. Subjects and Method: This study was crossover design. Fourteen patients with chronic stroke participated in the experiment. The posterior pelvic tilt taping, placebo taping, and no taping intervention was applied to subjects in random order. The posterior pelvic tilt taping was used for mechanical correction, and was involved in posterior pelvic tilting and facilitating muscle function. The placebo taping was maintained at 0% of the available tension. Gait ability was assessed by the GAITRite System, Timed Up & Go Test (TUG). All the measurements were performed immediately after taping. Result: Gait function in chronic stroke patients improved with posterior pelvic tilt taping. Gait velocity, step length, and stride length improved significantly in the posterior pelvic tilt taping intervention compared to placebo and no taping (p<0.05). H-H base support significantly decreased compared to no taping (p<0.05). Posterior pelvic tilt taping significantly improved TUG (p<0.05). Conclusion: We conclude that the posterior pelvic tilt taping method improves gait function of patients with chronic stroke. Gait disturbance is the most common problem after stroke. This problem is related to poor ADL and mobility, and increases risk of fall in severe cases [Sarah FT 2006]. For that reason, fast gait speed and improved gait pattern is the most important goal of stroke rehabilitation [An LH 2003]. The body alignment of stroke patients becomes asymmetric if they have a hemi-paralysis, muscle weakness, motor and sensory function decrease. These problems produce a hemiplegic gait in stroke patients [Byun SD 2011]. A hemiplegic gait includes body asymmetry, decreased weight bearing on the affected side, poor equilibrium reaction, and impaired selective motor control [Birol B 2014]. Good body alignment is very important clinically because asymmetry leads to inefficient energy during walking, risk of musculoskeletal injury in unaffected side, and loss of bone density [Kara KP 2010]. Excessive pelvic elevation and pelvic tilt angle is directly connected to hemiplegic gait and poor motor function in stroke patient causes an excessive pelvic tilt during gait [Chen CL 2003]. Hemiplegic gait results from combinations of pelvic anterior tilt and hiking, leading to decreasing stability of the body [Perry J 1992]. Pelvic stability is clinically important in patients with hemi-paralysis, and asymmetrical pelvic affects not only gait and hemiplegic gait pattern of lower extremity but functional ability such as trunk control and activity of the upper extremities [Kerrigan DC 2000]. Kong et al. [Kong SW 2015] reported that gait speed and balance control decreased in stroke patients due to increased pelvic displacement and suggested that control of pelvic displacement is important in rehabilitation for stroke patients. Pathak et al. [Shivani P 2014] showed that trunk stability could affect motor recovery of extremities since pelvic alignment influences trunk stability. Most stroke patients can walk independently regardless of an assistive device, but they have an abnormal gait pattern or cannot attain intact function because of disorders like an asymmetrical pelvis and decreased mobility. Many treatment methods have been researched to reduce problems and improve gait function [Byun SD 2011]. The Bobath and PNF (proprioceptive neuromuscular facilitation) approaches are the most commonly used methods in rehabilitation of stroke patients. Emilia et al. [Emilia M 2012] reported that the Bobath approach in stroke patients is an effective way to retrain a gait. Kim et al. [Kim SJ 2016] showed that gait parameters such as cadence, step length, and stride length significantly improved in stroke patients after six weeks with the PNF approach. Treadmill [Marco F 2009], underwater exercise [Nishiyori R 2016], robot device [Cho DY 2015], and orthosis [Sarah FT 2013] are used to improve gait function. Robot device and orthosis are used mainly to correct an asymmetric body alignment, but these are expensive and awkward devices. A taping method is an alternative approach for stroke rehabilitation because taping is inexpensive and easily adapted. Baek et al. [Beak YH 2001] reported that motor function on the affected side significantly improved with kinesiology taping on the muscles of the affected side. Maguire et al. [Maguire C 2010] compared hip abductor taping to cane use in stroke patients and concluded that taping is more effective than cane to improve gait speed and muscle activation of the hip abductor. Bae et al. [Bae YH 2015] reported that static stability improved after applying Lower-Leg- Kinesiology taping in a stroke patient with foot drop. Taping is commonly used to help rehabilitation in stroke patients but there has been no study of gait function in stroke patients with asymmetric pelvis after pelvic taping. Thus, the aim of this study is to verify immediate effects on gait in chronic stroke patients with excessive pelvic anterior tilting after applying pelvic posterior tilting taping using kinesiology tape. Patients in this study were recruited from D welfare center, after agreeing to participate in the study. The study was authorized by the Daegu Research Ethics Committee of Daegu University. The IRB number is 1040621-201611-HR-020-02. All study procedures were performed according to the Helsinki Declaration of Human Rights of 1975, modified in 1983, and all participants provided informed, written consent prior to enrollment in the study. Fourteen patients with stroke met the criteria. All patients were diagnosed with stroke, confirmed with computed tomography or magnetic resonance imaging. Patients were required to meet the following criteria for inclusion in the study: (1) chronic stroke involving cerebral regions (>6 months post stroke) with an anterior pelvic inclination (>15°, normal range 11 ± 4°) [Hagins M, 1998], (2) Brunnstrom’s stage of motor recovery for the affected lower limb range of 3–5, (3) ambulatory but with residual gait deficit defined as a visual gait abnormality assessed by a licensed physical therapist (including those who use a cane or walker), (4) ability to understand and follow simple verbal instructions, (5) independent gait ability to walk at least 15 m without assistance, (6) no disability in visual, auditory, and vestibular organs, (7) no history of orthopedic diseases, such as contracture, fracture, or arthritis in lower limbs, and (8) a Mini-Mental State Examination score greater than 24/30 [Folstein MF 1975]. Exclusion criteria were as follows: (1) neurological problems other than stroke that would interfere with gait and balance control, (2) pain, limited motion, or weakness in the non-paretic lower extremity that affected performance of daily activities (by self-report), and (3) allergy to the kinesiology tape or having a specific skin disease. The sample size for this study was calculated using the G* Power program 3.1.0 (G power program Version 3.1, Heinrich-Heine-University Du¨sseldorf, Du¨sseldorf, Germany). Based on data from a pilot study, the estimated sample size required to obtain a minimum power of 80% at a significant alpha level of 95% was 12. Accordingly, 14 participants were recruited to account for a potential dropout rate of 20%. This study was a crossover design. Subjects underwent all three interventions. The posterior pelvic tilt taping (Figure 1), placebo taping (Figure 2), and no taping intervention was applied to subjects in random order. For randomization, sealed envelopes were prepared in advance and marked inside with A, B or C representing posterior pelvic tilt taping, placebo taping, and no taping. Figure 1: Posterior Pelvic Tilt Taping. 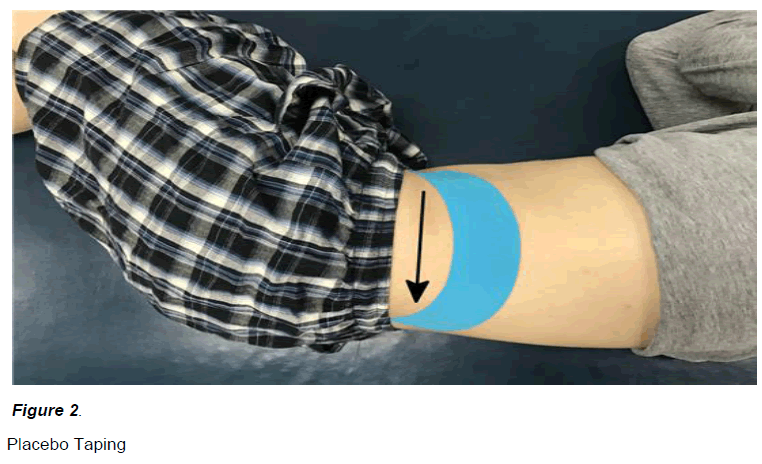 To eliminate the effect after tearing off the taping, a 10-minute break was given between posterior pelvic tilt taping and placebo taping intervention. This randomization was performed by a third party unaware of the nature of the study. Subject characteristics and all outcome measures obtained before and after treatment were assessed by Physician 1, who was blinded to treatment allocations. Taping was applied in a closed room by Physician 2, who was not involved in subject assessment. Both physicians were instructed not to communicate with subjects about study goals or treatments. The necessary sample size was assessed based on preliminary results. Calculation of sample size was based on an alpha of 0.05 and a statistical power of 0.08. Based on this calculation, we recruited 14 patients. The posterior pelvic tilt taping was applied by a single physical therapist fully trained in the kinesiology tape method. The elasticity of the kinesiology tape (BB TAPE; WETAPE Inc, Seoul, Korea) is approximately 70% to 80% stretch of the original length. According to the stretch guidelines provided by Kase et al. [Kase K 2003], the tension for facilitating muscle function is 25% to 50% of the available tension, and 50% to 75% for mechanical correction. I-type strips with approximately 50% of the available tension were placed over both the rectus abdominis (RA) and external oblique (EO) muscles, which are involved in posterior pelvic tilting, for facilitating muscle function [Kendall FP 2005]. I-type strips with approximately 75% of the available tension were applied from the anterior superior iliac spine (ASIS) to the posterior superior iliac spine (PSIS) to provide a mechanical correction effect (i.e., posterior tilt to the pelvis bilaterally). According to the published posterior pelvic tilt taping methodology, the first strip of tape was applied over the EO muscle, originating in the inguinal region and terminating on the spinous process of the twelfth thoracic vertebra. The second strip of tape originating at the ASIS was pulled over the PSIS. The participant was in the side-lying position, and the pelvis was maintained in the posterior pelvic tilt posture so that the participant would not experience pain while using the tape. The third tape strip, which was applied over the RA, originated near the pubic symphysis and terminated on the xiphoid process and fifth to seventh costal cartilages, while the participant was in the hooklying position [Lee JH 2014]. The direction of tape application is shown by the arrow. Participants were instructed to remove the tape immediately if they experienced itching of the skin underneath it. The placebo taping was applied by the same physical therapist with one I-type strip originating near the position above the ASIS, wrapping around the iliac crest and terminating above the PSIS while the participants were in a side-lying position. The tape was maintained at 0% of the available tension. Participants were naive about the kinesiology tape method, and it was explained that they were receiving two types of therapeutic taping applications. To reduce variability as much as possible, all taping was applied by one physical therapist who was well trained in the kinesiology tape method. The assessments were completed by the other physical therapist who was blinded to this study. Before starting the experiment, both physical therapists practiced the assessment methods used in this study for one day. Gait ability was assessed by the GAITRite System, Timed Up & Go Test (TUG). All of the measurements were performed immediately after the intervention. The participants did not receive any other therapeutic interventions during the study period. A GAITRite (GAITRite, CIR Systems Inc., USA) was used to measure the spatiotemporal variables of gait (walking speed, walking cycle, affected side stance phase, stride length) and the symmetry index (stance phase, stride length). The standard GAITRite walkway contains six sensor pads encapsulated in a carpet with an active area of 3.66 m in length and 0.61 m in width. As the subject walks along the walkway, the sensors capture each footfall as a function of time and transfer the information to a personal computer for processing into footfall patterns [McDonough Al 2001]. GAITRite can compare gait velocity (meter/sec), gait cycle (cycle/sec), and the symmetry index (%) of the stance phase and the swing phase, with normal category values on a histogram [Tong RK 2006]. A high test-retest reliability (ICC ranging from 0.72 to 0.94) has been demonstrated using this measure [Kuys SS 2011]. The subjects performed three trials, and the average of the three trials was calculated for analysis. The Timed Up and Go test (TUG) measures the dynamic balance ability and gait ability of the participants. Subjects were seated in a chair with armrests and then instructed to stand (using the armrests, if desired) and walk as quickly and as safely as possible for three meters. Subjects then turned around, returned to the chair, and sat down. The time from the point at which their spine left the back of the chair until they returned to that same position was recorded using a stopwatch. Each subject completed the TUG test three times with 30 s break between, and the average value was calculated. High intra-rater (ICC=0.99) and inter-rater (ICC=0.99) reliability have been demonstrated using this measure [Podsiadlo D 1991]. All statistical analyses were performed using SPSS (IBM Corp. Released 2011. IBM SPSS Statistics for Windows, Version 20.0. Armonk, NY: IBM Corp.). The dependent variables were dynamic and static balance test and gait function. Repeated one-way ANOVA was used to determine whether there were changes in balance and gait function among the posterior pelvic tilt taping, placebo taping and no taping interventions in each subject. Null hypotheses of no difference were rejected if p-values were less than 0.05. A CONSORT flow diagram is provided in Figure 3, and a summary of clinical and demographic features of the 14 study subjects in Table 1. The characteristics of the study subjects before and after each intervention are shown in Tables 2 and 3. Figure 3: Study flowchart. PPTT, Posterior Pelvic Tilt Taping; PT, Placebo Taping; NT, No Taping. Velocity, step length, stride length under the PPTT conditions increased significantly (p<0.05) compared to the placebo and no taping conditions (Figure 4). In the case of the H-H base support, PPTT condition decreased significantly (p<0.05) compared to the no taping condition (Figure 4). Figure 4: Comparison of the velocity, step length, stride length and H-H base support by taping method (*p < 0.05). The PPTT conditions compared to the placebo and no taping conditions improved significantly in the Timed Up & Go test (p<0.05) (Figure 5). 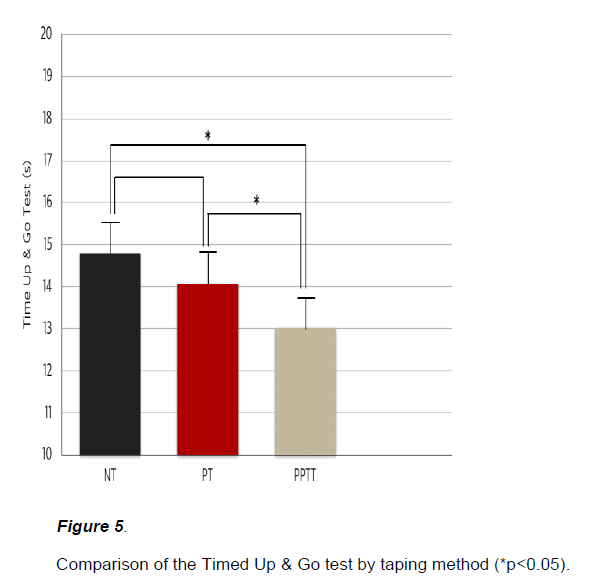 Figure 5: Comparison of the Timed Up & Go test by taping method (*p<0.05). This study evaluated the immediate effect on gait function in patients with chronic stroke after applying posterior pelvic tilt taping. Our results showed that gait function in chronic stroke patients improved after posterior pelvic tilt taping. These results support the hypothesis that posterior pelvic tilt taping method decreases excessive pelvic anterior tilting and affects gait in patients with chronic stroke. Gait velocity, step length, and stride length improved significantly with posterior pelvic tilt taping compared to placebo and no taping. H-H base support decreased significantly compared to no taping. Moreover, posterior pelvic tilt taping significantly improved TUG and 10MWT compared with the two other interventions. This study suggests possible mechanisms explaining the effects of kinesiology taping on the improvement of gait function in patients with chronic stroke. First, posterior pelvic tilt taping, which we used, is a mechanical correction taping method. Many studies reported that kinesiology taping has a mechanical effect. Lee et al. [Lee JH, 2011] reported that pelvic angle and musculoskeletal diseases around the lower lumbar decreased after anterior pelvic tilt taping, a mechanical taping method for office workers with slump sitting. Lee et al. [Lee JH, 2012] proved that posterior pelvic tilt taping decreased pelvic angle and sacral horizontal angle and has a positive effect on medical buttock pain and sacroiliac joint dysfunction in patients with chronic lower back pain caused by increased sacral horizontal angle and sacroiliac joint dysfunction. Our study applied posterior pelvic tilt taping to decrease anterior pelvic tilting in patients with abnormal gait pattern caused by excessive anterior pelvic tilting. Gait velocity, step length, stride length, H-H base support, TUG, and 10MWT significantly improved by decreasing anterior pelvic tilting. This study used kinesiology tape that is elastic, not the commonly used non-elastic taping. This means people can freely move within an elastic range with correction of the body alignment. Another mechanism can be explained as a methodological component of posterior pelvic tilt taping. The posterior pelvic tilt taping used in this study is mechanical correction taping, an experimental method developed by Lee [Lee JH, 2014]. This method is composed of three parts. When applying this method, direction and tensile strength are important. The first step is to tape the EO muscle from ASIS to thoracic vertebra 12. The second step is to tape on the side from the ASIS to PSIS along the iliac crest. The last step is to tape the RA muscle from the pubic symphysis to the xiphoid process. In each step, tape can decrease excessive pelvic anterior tilting of the affected side and improve posterior pelvic tilting by using a strong tape tension of 70~80%. There was significant difference in gait parameters. Thus, stability of the trunk and pelvis improved, and motor recovery [Shivani P, 2014] of the extremity improved by correcting misalignment pelvic. Finally, kinesiology taping increases sensory input. Gokhan et al. [Gokhan Y, 2015] reported that somatosensory information improved, ankle muscles were activated, and balance function increased when kinesiology tape was applied on the ankle and foot of the affected side in patients with stroke. Tremblay et al. [Tremblay F, 2015] showed that elastic kinesiology tape could not control the activation of cerebral cortex in a functionally meaningful way, but influenced the neuromuscular level. Moreover, their study proved that tactile stimulation by kinesiology tape could alleviate muscle weakness caused by decreasing Ia afferents fiber [Yu K, 2013]. For this reason, we suppose that sensory input was increased in asymmetrical pelvic of stroke patients by using kinesiology tape, so gait parameters changed significantly. The taping method we used is cheap and easy to apply compared to robot device, orthosis, and other interventions. We demonstrated that taping is a proper treatment to improve gait function of stroke patients. The current study has some limitations. First, the small sample size may have influenced certain variables and influenced the results. Therefore, these results cannot be generalized to all stroke patients. Second, due to the absence of follow-up after completion of taping, the durability of the effect of this intervention could not be determined. Hence, further research, including a long-term follow-up assessment, are needed to evaluate the long-term benefits of taping. This study conclude that the posterior pelvic tilt taping intervention improves gait function of patients with chronic stroke. Tyson SF, Hanley M, Chillala J, Selley A, Tallis RC (2006) Balance disability after stroke. Physical Therapy 86(1): 30-8. An LH, Pei FT, Mei HJ (2003) Analysis of impairments influencing gait velocity and asymmetry of hemiplegic patients after mild to moderate stroke. Arch Phys Med Rehabil 84(8): 1185-93. Byun SD, Jung TD, Kim CH, Lee YS (2011) Effects of the sliding rehabilitation machine on balance and gait in chronic stroke patients: a controlled clinical trial. ClinRehabil 25(5): 408-15. Birol B, Fatih T (2014) Gait disturbances in patients with stroke. Phys Med Rehabil6(7): 635-42. Kara KP, William HG, Dina B, Sandra EB, William EM (2010) Evaluation of gait symmetry after stroke: A comparison of current methods and recommendations for standardization. Gait Posture 31(2): 241-46. Chen CL, Chen HC, Tang SF, Wu C, Cheng P (2003) Gait performance with compensatory adaptations in stroke patients with different degrees of motor recovery. Am J Phys Med Rehabil 82(12): 925-35. Perry J, Davids JR, Thorofare, Jacquelin (1992) Gait analysis: normal and pathological function. Journal of Pediatric Orthopaedics 12(6): 815. Kerrigan DC, Frats EP, Rogan S, Riley PO (2000) Hip hiking and circumduction: Quantitative definitions. Am J Phys Med Rehabil 79(3): 247-52. Kong SW, Jeong YW, Kim JY (2015) Correlation between balance and gait according to pelvic displacement in stroke patients. J Phys Ther Sci 27(7): 2171-84. Shivani P, Vijaya KK, Akshatha N, Rakshith CK (2014) The relationship between pelvic alignment and trunk control in stroke subjects: a cross-sectional study. Int J Res med Sic 2(4): 1483-87. Emilia M (2012) Normalized gait parameters in NDT-Bobath post stroke gait rehabilitation. Cent Eur J Med 7(2): 176-82. Kim SJ, Cho JW, Chung HA (2016) Effects of using scapular-pelvic patterns simultaneously to improve the components of gait in patients with stroke. Journal of Korea Proprioceptive Neuromuscular Facilitation Association 14(2): 75-81. Marco F, Stefano C, Maurizio A, Antenucci R, Malgrati D, et al. (2009) Walking after stroke: What does treadmill training with body weight support add to overground gait training in patients early after stroke? Stroke 40(9): 3079-85. Nishiyori R, Lai B, Lee DK, Vrongistinos K, Jung T (2016) The use of cuff weights for aquatic gait training in people post-stroke with hemiparesis. Physiother Res Int 21(1): 47-53. Cho DY, Park SW, Lee MJ, Kim EJ (2015) Effects of robot assisted gait training on the balance and gait of chronic stroke patients: focus on dependent ambulators. J Phys There Sci 27(10): 3053-57. Sarah FT, Ruth MK (2013) Effects of an ankle-foot orthosis on balance and walking after stroke: a systematic review and pooled meta-analysis. Arch Phys Med Rehabil 94(7): 1377-85. Beak YH, Seo JC, Lee JD (2011) The effect of taping on the activity of daily living if poststroke-hemiplegic: a clinical study. J Korean Acupunct Moxibustion Soc 18(2): 175-85. Maguire C, Sieban JM, Frank M, Romkes J (2010) Hip abductor control in walking following stroke-the immediate effect of canes, taping and TheraTogs on gait. ClinRehabil 24(1): 37-45. Bae YH, Kim HG, Min KS, Lee SM (2015) Effects of lower-leg kinesiology taping on balance ability in stroke patients with foot drop. Evid Based Complement Alternat Med 1-5. Hagins M, Brown M, Cook C, Strimbeck K (1998) Intratester and intertester reliability of the palpation meter (PALM) in measuring pelvic position. J Man ManipTher 6(3): 130-36. Folstein MF, Folstein SE, McHugh PR (1975) “Mini-mental state”: A practical method for grading the cognitive state of patients for the clinician. J Psychiatr Res 12(3): 189-98. Kase K, Wallis J, Kase T (2003) Clinical therapeutic applications of the kinesio taping method. Kinesio Taping Association. Kendall FP, McCreary EK, Provance PG, Rodgers MM, Romani WA (2005) Muscles testing and function with posture and pain. 5th ed. Lippincott Williams & Wilkins. Lee JH, Yoo WG, Kim MH, Oh JS, Lee KS, et al. (2014) Effect of posterior pelvic tilt taping in women with sacroiliac joint pain during active straight leg raising who habitually wore high-heeled shoes: a preliminary study. J Manipulative Physio Ther 37(4): 260-68. McDonough Al, Batavia M, Chen FC, Kwon S, Ziai J (2001) The validity and reliability of the GAITRite system’s measurements: a preliminary evaluation. Arch Phys Med Rehabil 82(3): 419-25. Tong RK, Ng MF, Li LS, So EF (2006) Gait training of patients after stroke using an electromechanical gait trainer combined with stimultaneous functional electrical stimulation. Phys Ther 86(9): 1282-94. Kuys SS, Brauer SG, Ada L (2011) Test-retest reliability of the GAITRite system in people with stroke undergoing rehabilitation. DisabilRehabil 33(19-20): 1848-53. Podsiadlo D, Richardson S (1991) The timed “Up and Go”: a test of basic functional mobility for frail elderly person. J Am GeriatrSoc 39(2): 142-48. Lee JH, Yoo WG (2011) The mechanical effect of anterior pelvic tilt taping on slump sitting by seated worker. Industrial Health 49(4): 403-9. Lee JH, Yoo WG (2012) Application of posterior pelvic tilt taping for the treatment of chronic low back pain with sacroiliac joint dysfunction and increased sacral horizontal angle. Physical Therapy in Sport 13(4): 279-85. Gokhan Y, Arzu GG, Deniz B, Aksoy S, Nazliel B, et al. (2015) Does correcting position and increasing sensorial input of the foot and ankle with kinesio taping improve balance in stroke patients? NeuroRehabilitation 36(3): 345-53. Tremblay F, Karam S (2015) Kinesio-taping application and corticospinal excitability at the ankle joint. J Athl Train 50(8): 840-846. Yu K (2013) Tactile stimulation with kinesiology tape alleviates muscle weakness attributable to attenuation of Ia afferents. J Sci Med Sport 16(1), 45-48.